A very nice piece of Mexican pottery you will use again and again. 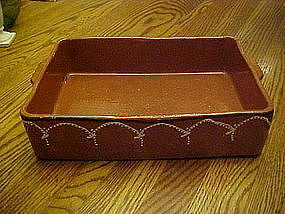 Measures 8x11, the perfect size for a good batch of Enchiladas or your favorite Mexican casserole. Decorated in relief with nice swag decoration. Glazed inside and outside, (except for the very bottom), tab handles. Pristine condition with not the slightest damage.